Astronomers at the University of Hertfordshire are part of an international team which has observed unprecedented views of a ring in the centre of our Milky Way galaxy with the Herschel Space Observatory. 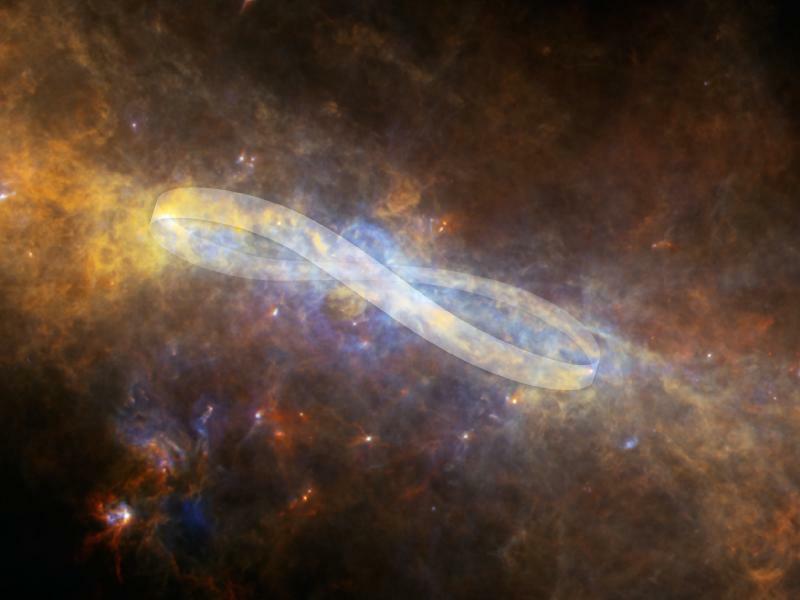 The ribbon of gas and dust is more than 600 light years across and appears to be twisted, for reasons which have yet to be explained. The origin of the ring could provide insight into the history of the Milky Way. The new results are published in a recent issue of the Astrophysical Journal Letters. The reason for the ring’s twist and offset are unknown, but understanding their origin may help explain the origin of the ring itself. Computer simulations indicate that bars and rings such as those we see in the centre of our Galaxy can be formed by gravitational interactions. It is possible that the structures in the heart of the Milky Way were caused by interactions with our largest neighbour, the Andromeda Galaxy. Herschel is a European Space Agency cornerstone mission, with science instruments provided by consortia of European institutes and with important participation by NASA. Herschel is a flagship mission of the UK Space Agency, which funds the UK's involvement in the UK-led SPIRE instrument. The SPIRE instrument was built, assembled and tested in the UK at The Rutherford Appleton Laboratory in Oxfordshire by an international consortium from Europe, US, Canada and China, with strong support from the Science and Technology Facilities Council. SPIRE was developed by a consortium of institutes led by Cardiff Univ. (UK). The images were obtained as part of the Herschel Key Project Hi-GAL, which is led by Sergio Molinari of the Institute of Space Physics in Rome and who is lead author of the new paper.